The Deep End Advice Worker Project – embedding an advice worker in general practice settings produced by the Glasgow Centre for Population Health. The Deep End Group are one of the main voices for GPs serving disadvantaged communities. If you only have limited time read the Deep End one – it’s more thorough and better; this is why…. It’s positive that Citizens Advice and the RCGP have produced a joint report, hopefully there is more to come – but its conclusions and evidence are already well rehearsed – although it is good to have this information in one place. Unfortunately, “Advice in Practice” does not mention inequality (or deprivation or disadvantage) at all! 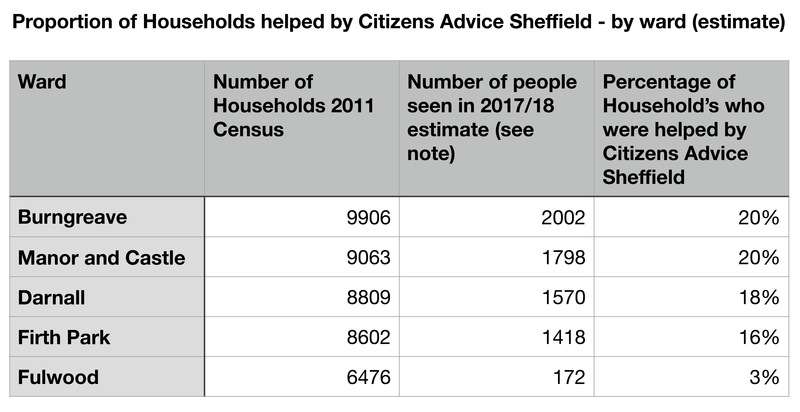 As I mentioned in an earlier blog Citizens Advice Sheffield serves people from across the city but we are far more likely to be needed and used by people in poorer communities – we see 20% of households each year in the poorest wards in Sheffield compared to 3% in the wealthiest! This is an inequality issue – the pressures faced by people on low income plays out in general practice too, there is no recognition of this at all in the report. I think that the data in the Citizens Advice/RCGP report must be treated with caution because by giving a country average it masks what a difference in the balance of demand between practices serving wealthier communities and those serving poorer ones. It concludes that non-clinical issues take up 20% of GP time. Anecdotally I am told by Deep End GPs that this proportion is higher in practices serving poorer communities. “Before this service was introduced (welfare rights), 50% of my workload was taken up by the socioeconomic problems of patients” – GP quoted in SROI and Co-location report. Contrast this with the Deep End report which explicitly focusses on the relationship between poverty, welfare rights and primary care. The Deep End service model is an embedded model – more integrated than the “co-located” one described in the Citizens Advice/RCGP report not only are advice workers on site but they have (through informed consent) access to medical records held by the General Practice. They are not only providing a service of direct benefit to patients but also have some evidence that they are reducing GP workloads. Tactically focussing on the most deprived areas makes sense – it gives a clear message to commissioners that a more targeted approach is appropriate and achievable. Following on from this I think that there is a growing case to be made for a different service model in disadvantaged communities for general practice which should include welfare rights provision – this will require a change in behaviour by GPs and Welfare rights agencies – the Deep End report is a useful example – particularly with regard to data sharing. national bodies need to set out the arguments for how these services should be funded. To date there has been a reliance on individual commissioning champions leading to models that include public health budgets, CCGs and sometimes practices themselves. This is not systematic or sustainable. With thanks to Dan Hopewell from Bromley Bow and Oonagh Robinson from the University of Glasgow for her advice. Great to learn more about the “Deep End Project” . I had heard of this project a few years ago and sometimes have wondered about the outcomes of this work. It seems to me that an article about this project and the outcomes should become a feature article in the magazine called “THE CLERK” which is sent every two months to about 5,000 Town Clerks and Parish Clerks in the UK now that The Society of Local Council Clerks has decided to include “Health and Well Being” in its CPD offer to its members and the many thousands of volunteer Town and Parish Cllrs. Three examples all from today lead me to conclude that more than co-location is required. One reply for evidence supporting an from an extremely busy practice in one of the poorest wards in Sheffield. Two pages long, absolutely to the point and I believe will be invaluable for the Tribunal. A second reply from another practice stating that they charge for reports and anyway what can they glean from short consultations with the patient. Third a client living in the least deprived (but most unequal) ward in Mark’s chart where the GP has refused a Fit Note to a client appealing an ESA decision because the DWP have written saying they no longer require a Fit Note. And to cap it, yesterday drafted an appeal where a named GP correctly informed the DWP that he hadn’t seen the patient for 14 years and the DWP used that as evidence (notwithstanding that it was clear from the papers that the client regularly saw another GP at the practice). I didn’t notice this in NHS England’s latest ideas for saving money on varicose vein ops etc.The idea that a GP might spend 50% of their time on non clinical issues should be headline news. However this would mean acknowledging that poverty and inequality are major factors in health & well-being – which any fule kno (unless you are Jeremy Hunt). Partnerships between CABs & GPs sounds to be a really good idea, and targeting certain areas for special support for this should be in the Labour manifesto. The latest Tweets on #Libraryness. Read what people are saying and join the conversation. Hi Mike – its always good to get a reference in to Nigel Molesworth!